For other uses, see Reef (disambiguation). In biology and ecology, abiotic components or abiotic factors are non-living chemical and physical parts of the environment that affect living organisms and the functioning of ecosystems. Abiotic factors and the phenomena associated with them underpin all biology. Artificial reefs (e.g. shipwrecks) sometimes have a role in enhancing the physical complexity of featureless sand bottoms, in order to attract a diverse assemblage of organisms, especially algae and fish. Earth's largest reef system is the Great Barrier Reef in Australia, at a length of over 2,300 kilometres (1,400 miles). The term oyster reef refers to dense aggregations of oysters that form large colonial communities. Because oyster larvae need to settle on hard substrates, new oyster reefs may form on stone or other hard marine debris. Eventually the oyster reef will propagate by spat settling on the shells of older or nonliving oysters. The dense aggregations of oysters are often referred to as an oyster reef, oyster bed, oyster bank, oyster bottom, or oyster bar interchangeably. These terms are not well defined and often regionally restricted. Sponge reefs are reefs formed by Hexactinellid sponges, which have a skeleton made of silica, and are often referred to as glass sponges. Such reefs are now very rare, and found only on the western Canadian continental shelf. Although common in the late Jurassic period, sponge reefs were believed to have gone extinct during or shortly after the Cretaceous period, until the existing reefs were discovered in 1987–1988 - hence these sometimes being dubbed living fossils. These biotic reef types take on additional names depending upon how the reef lies in relation to the land, if any. Reef types include fringing reefs, barrier reefs, and atolls. 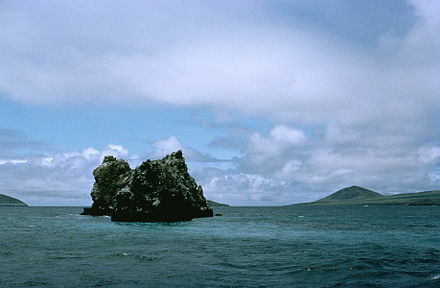 A fringing reef is a reef that is attached to an island. 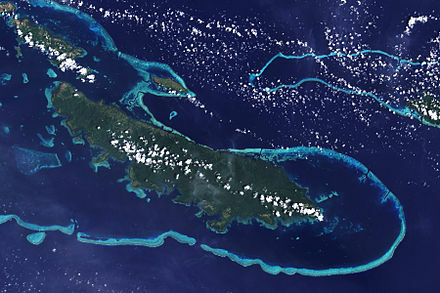 A barrier reef forms a calcareous barrier around an island resulting in a lagoon between the shore and the reef. 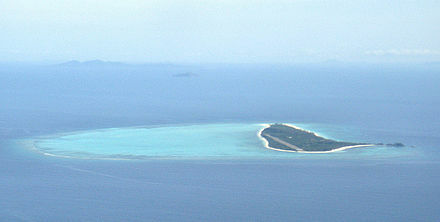 An atoll is a ring reef with no land present. The reef front (ocean side) is a high energy locale whereas the internal lagoon will be at a lower energy with fine grained sediments. The history of Earth concerns the development of planet Earth from its formation to the present day. 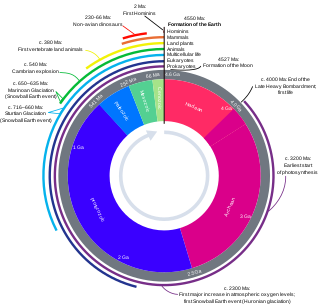 Nearly all branches of natural science have contributed to understanding of the main events of Earth's past, characterized by constant geological change and biological evolution. One useful definition distinguishes reefs from mounds as follows: Both are considered to be varieties of organosedimentary buildups – sedimentary features, built by the interaction of organisms and their environment, that have synoptic relief and whose biotic composition differs from that found on and beneath the surrounding sea floor. Reefs are held up by a macroscopic skeletal framework. Coral reefs are an example of this kind. Corals and calcareous algae grow on top of one another and form a three-dimensional framework that is modified in various ways by other organisms and inorganic processes. By contrast, mounds lack a macroscopic skeletal framework. Mounds are built by microorganisms or by organisms that don't grow a skeletal framework. A microbial mound might be built exclusively or primarily by cyanobacteria. Examples of biostromes formed by cyanobacteria occur in the Great Salt Lake in Utah, and in Shark Bay on the coast of Western Australia. Cyanobacteria do not have skeletons, and individuals are microscopic. Cyanobacteria can encourage the precipitation or accumulation of calcium carbonate to produce distinct sediment bodies in composition that have relief on the seafloor. Cyanobacterial mounds were most abundant before the evolution of shelly macroscopic organisms, but they still exist today; stromatolites are microbial mounds with a laminated internal structure. Bryozoans and crinoids, common contributors to marine sediments during the Mississippian, for instance, produced a very different kind of mound. Bryozoans are small and the skeletons of crinoids disintegrate. However, bryozoan and crinoid meadows can persist over time and produce compositionally distinct bodies of sediment with depositional relief. 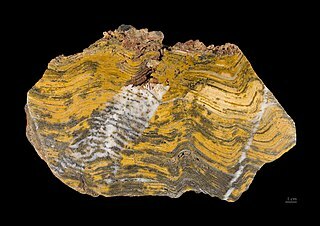 Stromatolites or stromatoliths are layered mounds, columns, and sheet-like sedimentary rocks that were originally formed by the growth of layer upon layer of cyanobacteria, a single-celled photosynthesizing microbe. Fossilized stromatolites provide records of ancient life on Earth. Lichen stromatolites are a proposed mechanism of formation of some kinds of layered rock structure that are formed above water, where rock meets air, by repeated colonization of the rock by endolithic lichens. A cay, also spelled caye or key, is a small, low-elevation, sandy island on the surface of a coral reef. Cays occur in tropical environments throughout the Pacific, Atlantic and Indian Oceans. Scleractinia, also called stony corals or hard corals, are marine animals in the phylum Cnidaria that build themselves a hard skeleton. The individual animals are known as polyps and have a cylindrical body crowned by an oral disc in which a mouth is fringed with tentacles. Although some species are solitary, most are colonial. The founding polyp settles and starts to secrete calcium carbonate to protect its soft body. Solitary corals can be as much as 25 cm (10 in) across but in colonial species the polyps are usually only a few millimetres in diameter. These polyps reproduce asexually by budding, but remain attached to each other, forming a multi-polyp colony of clones with a common skeleton, which may be up to several metres in diameter or height according to species. The Rugosa, also called the Tetracorallia, are an extinct order of solitary and colonial corals that were abundant in Middle Ordovician to Late Permian seas. Algal mat is one of many types of microbial mat formed on the water surface or on the surface of rocks. It is made out of blue-green cyanobacteria and sediments. It is formed by having alteration layers between the blue-green bacteria and sediments, creating dark-laminated layers. Stromatolites are prime examples of algal mat. Algal mats played an important role in the Great Oxidation Event on Earth some 2.3 billion years ago. Overpopulation of algal mat may be an ecological problem, when mats disrupt the other underwater marine life by blocking the sunlight. The Chazy Reef Formation is a mid-Ordovician limestone deposit in northeastern North America. Fire corals (Millepora) are a genus of colonial marine organisms that exhibit physical characteristics similar to that of coral. The name coral is somewhat misleading, as fire corals are not true corals but are instead more closely related to Hydra and other hydrozoans, making them hydrocorals. They make up the only genus in the monotypic family Milleporidae. Skeletal eroding band (SEB) is a disease of corals that appears as a black or dark gray band that slowly advances over corals, leaving a spotted region of dead coral in its wake. It is the most common disease of corals in the Indian and Pacific Oceans, and is also found in the Red Sea. Rothpletzella is a genus of calcimicrobe known from the Silurian of Gotland, the Devonian of France, as well as the Ordovician of China. It has been hypothesised to be a cyanobacterium, and shares morphological similarities with extant cyanobacteria. Shallow water marine environment refers to the area between the shore and deeper water, such as a reef wall or a shelf break. This environment is characterized by oceanic, geological and biological conditions, as described below. The water in this environment is shallow and clear, allowing the formation of different sedimentary structures, carbonate rocks, coral reefs, and allowing certain organisms to survive and become fossils. 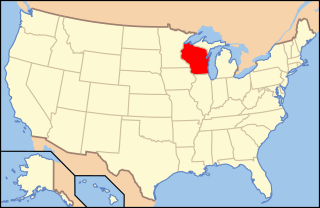 Fossils of many types of water-dwelling animals from the Devonian period are found in deposits in the U.S. state of Michigan. Among the more commonly occurring specimens are bryozoans, corals, crinoids, and brachiopods. Also found, but not so commonly, are armored fish called placoderms, snails, sharks, stromatolites, trilobites and blastoids. Paleontology in Wisconsin refers to paleontological research occurring within or conducted by people from the U.S. state of Wisconsin. Wisconsin has a relatively sparse fossil record. Fossils found in Wisconsin are generally very old, most ranging from 500 to 300 million years in age. During the early part of the Paleozoic era, Wisconsin was covered by a warm, shallow sea that would be home to creatures like brachiopods, bryozoans, cephalopods, corals, crinoids, and trilobites. During the Silurian, Wisconsin was home to massive reef system that formed one of the most biodiverse habitats in all of North America at the time. The interval spanning the Permian, Mesozoic, Paleogene and Neogene are missing from the local rock record. During the Ice Age the local climate became cold. Seals, walruses, and whales left behind fossil remains in the state near the Great Lakes. On land, hemlock and spruce trees formed forests inhabited by creatures like giant beavers, horses, and woolly mammoths. The first fossil reef systems ever scientifically documented in North America were discovered in the area around Milwaukee. The Silurian reefs of the Milwaukee area were also the first known fossil reefs from the Paleozoic era. Their associated fauna is one of the most diverse from the period ever documented in North America. The Ordovician to Silurian trilobite Calymene celebra is the Wisconsin state fossil. Ocean acidification threatens the Great Barrier Reef by reducing the viability and strength of coral reefs. The Great Barrier Reef, considered one of the seven natural wonders of the world and a biodiversity hotspot, is located in Australia. 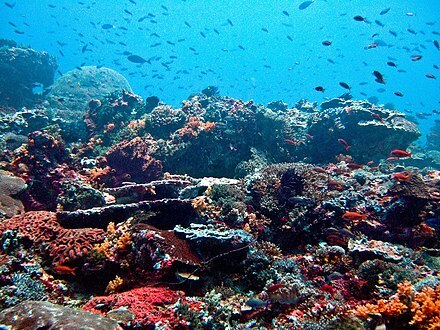 Similar to other coral reefs, it is experiencing degradation due to ocean acidification. Ocean acidification results from a rise in atmospheric carbon dioxide, which is taken up by the ocean. This process can increase sea surface temperature, decrease aragonite, and lower the pH of the ocean. Microbialite is a rock or benthic sedimentary deposit made of carbonate mud that is formed with the mediation of microbes. The constituent carbonate mud is a type of automicrite, or authigenic carbonate mud, and therefore it precipitates in situ instead of being transported and deposited. Been formed in situ, a microbialite can be seen as a type of boundstone where reef builders are microbes, and precipitation of carbonate is biotically induced instead of forming tests, shells or skeletons. Bacteria can precipitate carbonate both in shallow and in deep water and so microbialites can form regardless of the sun light. Automicrite is autochthonous micrite, that is, a carbonate mud precipitated in situ and made up of fine-grained calcite or aragonite micron-sized crystals. It precipitates on the sea floor or within the sediment as an authigenic mud thanks to physicochemical, microbial, photosynthetic and biochemical processes. It has peculiar fabrics and uniform mineralogical and chemical composition. Scolymia cubensis is a solitary coral that belongs the Scolymia family. It is a smooth disk coral who’s shape usually consists of a flat, concave form (patellate) or an inverted cone form. However, a cylindrical shape may occur. They have a maximum diameter of 10 cm and have a symbiotic bond with zooxanthellae. Despite this, S. cubensis do not create their own reefs. Their colors normally consist of light green, light beige or a deep rusty red. ↑ Schieber, Jürgen (1998). "Possible indicators of microbial mat deposits in shales and sandstones: Examples from the Mid-Proterozoic Belt Supergroup, Montana, U.S.A." (PDF). Sedimentary Geology . 120 (1–4): 105–124. doi:10.1016/S0037-0738(98)00029-3. Wikimedia Commons has media related to Reefs .